Can religious people save the environment? Can the environmental challenge save religion? 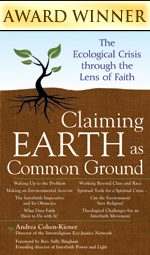 In this urgent call to action, Cohen-Kiener gathers insights from ecology coalitions, emerging theologies, and spiritual and environmental activists to rally and inspire us to work across denominational lines in order to fulfill our sacred imperative to care for God’s creation. Cohen-Kiener and contributors clearly outline the shared values of our faith traditions that drive our commitment to care for the earth. Acknowledging the challenges in working together to implement positive change, they present steps—both big and small, for individuals and groups—for reversing our direction from consumption to sustainability. I wanted to share perspectives gained from my life’s work of organizing communities for faithful collective action. Working together with other sincere people allows us to manifest our fondest hopes and dreams. So I try to give ways for communities to think about and respond to earth crises together. I also wanted to help people see the wide range of concerns that are part of this conversation. Earth crisis is a pastoral issue because we are depressed from our disconnection overload. Earth crisis is about resource scarcity and pursuant instability, so our issue is also about war and peace. It is an economic issue because 80% of our health problems and costs would disappear if we grew or bartered for 60% of our food. Earth crisis is a spiritual issue because the way we live removes us from the greater part of who we are. I wanted to include chapters in the book that connect these dots. We wanted an active verb for the first part. I wanted earth in there because it is the most inclusive word we have for talking about our planet. It invokes the aspect of world-as-farm. The idea of common ground, too, is a most important concept. It is something to seek. It is a way to look at things. When we seek differences, we find them. The earth and the global crises we are living are our common ground. We can only help ourselves and each other by looking at earth�our home and inheritance�this way. What changes in the environment are getting your attention right now? What are your major concerns about the environmental crisis? What do you consider to be the spiritual components of the environmental challenges we face? How you see your relationship to the trash mountain? What do you contribute? Do you think the problems of our excess trash are connected with our spiritual misalignment? What manifestations of global warming in your area have you noticed? Has it changed how you live? Where would you say you are in the five stages of grief (denial, anger, bargaining, depression, or acceptance) about global warming and why? How do you see your faith helping you become an agent of transformation for the environment? Take a look at the “Many Small Steps” list in the appendix. Choose three steps you could begin doing immediately. Then add one step each week until you are living the most ecological lifestyle you can. Why did you choose those three to start with? What in your faith calls you to creation care? What are the “green roots” of your faith tradition? What advantages can you see in collaborating with people of other faiths on environmental issues? What might be the obstacles? What troubles you about interfaith efforts? What inspires you? What language of your faith do you think might be hardest for a person of another faith to accept? What language of another faith do you find hardest to accept? What language do you share in faith? What is your personal challenge in agreeing that “we are all in this together”? Which individual or group of another faith would you invite to engage in a discussion about creation care? What would you like to say to them? What do you need to hear from them? What influence can you imagine an interfaith environmental effort might have that people from your faith alone might not? What steps could you take toward connecting with people of other faiths on an environmental issue? What does a rich life mean to you? How do you think the economy and the environment are related? What models of economy from biblical times do you think would help us today? What models from other countries or cultures would help us? What part(s) of Ezekiel’s vision of dry bones resonates with you and why? What part of your faith calls you to the environmental table? What “urgings of the spirit” have you felt to become involved in environmental action? Who comprises your social wealth? In what ways is this more valuable to you than material wealth? How does your congregation support social wealth? What do you think of the idea that the pleasure of savoring deep, meaningful moments might do more to save the planet than hard sacrifice? What is your sense of corporate culture today? In what ways do you see yourself participating in it? contributing to it? rejecting it? Have you run into “green washing”? In what way? How can you let these companies know about your concerns? What alternatives can you imagine to change “business as usual” in your job or school or community? What about in your church or synagogue or mosque? What impact might this begin to have on your local environment? What would you say are the greatest environmental concerns in your community? How do environmental problems impact race and class in your town, or in the nearest city? What would your reaction be if you found out that a company wanted to build a pollution-generating business or a toxic chemical plant in your neighborhood? What would you try to do about it? Woody Bartlett affirms that to heal the planet, we must build long-term, individual relationships between people of differing class and race. Yet, at the same time, he admits it is not always comfortable. Where do you see yourself on this issue? What makes you uncomfortable? What motivates you to move forward? Which churches would you identify as the “ethnic churches” in your community? What environmental concerns do you think you share? How, and with whom, might you invite an open-ended inquiry into these concerns? What do you think are the links between environmental degradation and human misery, unemployment, violence, health, migration, and isolation? What are some of the ways you see environmental efforts as being able to support human dignity and safer communities? How might you get to the table of a group or church or organization of another race or class? Where could you show up? Where have you noticed someone of a different race or class doing something about the environmental concerns in your community? How might you connect with them to pool your energy and resources? Can you think of a mutual project you might work on together? What would be the first steps toward making this possible? What do you believe about the relationship between God, humanity, and creation? How do you see or feel your relationship with the rest of creation? Where do you feel your interconnectedness with all of life? Do you have a moment to share about feeling alive in the living universe? Where were you? Can you recall the feeling now? How does that experience relate to your faith? Does your faith guide you in your environmental actions? How? Has your understanding of the universe, and the human place and purpose in it, changed over the years? What do you think of Rev. Tom Carr’s idea that we are planetary creatures, first and foremost, and that to harm the planet is to harm all beings that are alive here? What role do you think cataclysm might play in our current environmental crises, both in terms of destruction and of new life? Do you feel that we are trying to live above the earth and separate from nature? How has that affected us? How do you understand the phrase in the end, all is one? How do you think religion can complement environmental stewardship? Do you think the environmental challenge can invigorate religion? How? What are your concerns about food production in our country? Do you know any local farmers who have been affected by high-tech food production? What is being done in your area to support local foods? How might you help? Have you considered, or are you doing, organic gardening in your yard or community? How does your gardening open you to your connection with the earth? With your faith? What could you or your faith group do to support and encourage community gardens? Elisheva Rogosa says, “Loss of heritage wheats is a worldwide, silent crisis.” What is your understanding of genetically modified foods? How important do you think it is to preserve heritage seeds? Are you aware of any local groups who are pursuing this? What might you do to become more involved? Andrea Ferich makes the statement that “the average American dinner plate of food travels 1,600 miles, and two-thirds of our domestic waste is food packaging.” How much does this concern you? What steps could you take to change this in your neighborhood? At your local store? Andrea Ferich describes ways to intercept children’s decisions about buying junk food. What do you think you could do within your own family to influence your children’s decisions? The simple acts of growing food and nourishing each other are basic to human life. How do you participate in this process? Where are you cut off from it? How is it a gain and how is it a loss to be separate from food production? How does your religion view the dichotomy between body and soul? How do you experience this? Where do you see the relationship between spiritual hunger and material hunger in your life? What has your experience been of feeling closer to God in uncivilized places? How do you think our efforts to conquer nature have hurt us? How have they separated us from our Creator? What have we lost? Where in your life do you think the phrase less is more is truly needed? What would be the potential rewards for you? Can you imagine designing a custom-made Sabbath? What might it look like? What might you do with the quiet, the freedom? How might Sabbath time help you practice the art of receiving? How might a practice of resting in nature make you a better steward of nature? What new Sabbath rituals can you image creating that would contribute to making a smaller ecological footprint? How might you share these rituals with your religious community? Rev. Donna Schaper writes, “Before we save the world, we must remember to savor it.” How do you see this as an important part of creation care? What might such a declaration mean in your own life? If you were to rate yourself on a giver�receiver scale of 1 to 10, with 1 being all giving and 10 being all receiving, where would you be? Why? If you were to look at your faith tradition with “green eyes,” what would you see in its teachings about earth care? about consumption? about balance? about the interconnections between all life? When in your life have you experienced what Bullitt-Jonas describes as the Creation Stage, falling in love with the beauty of God’s creation? What might you need to change to honor “the first bit of nature with which you’ve been entrusted: your own body”? Where and how do you see the Crucifixion Stage�the assault on nature�taking place? How have you, or your church or community, been denying it? What do you need to mourn? What do you need to feel anger for? What are some ways you could enter the Resurrection Stage of eco-conversion, the stage of healing? Whom might you look to for support? What do you see as the role of prayer in eco-conversion? What witnesses have you seen for the care of the earth? How have these people’s activism nourished a larger community? As you consider all that you’ve read in this book, what is your understanding of the environmental crisis as a manifestation of a spiritual problem? What is your hope for the immediate future? for the long-term future? How do you think your faith, along with the faith of others, can empower this to happen?